Marlin Equity Partners, a Los Angeles California-based private investment firm with over US$1 billion of capital under management, will acquire all of the outstanding shares of Tellabs in a deal valued at $891 million ($2.45 per share in cash, representing a 4.3% premium over the closing price on October 18th). "This transaction will deliver to Tellabs stockholders certainty of value and liquidity, immediately upon closing," said Vince Tobkin, Tellabs chairman. "Tellabs' Board of Directors arrived at the decision to enter into a transaction with Marlin after a thorough review of Tellabs' strategic alternatives and after more than 30 potential buyers, both strategic parties and financial sponsors, were contacted as part of a competitive bidding process. “This deal reinforces Marlin’s long-term commitment to the telecommunications market sector and the business potential we believe is being driven by the concurrent demand for high-bandwidth mobile, video, and cloud-based services and applications,” said Pat DiPietro, an operating partner at Marlin. “Tellabs has an exceptionally strong heritage of technology innovation and customer-centric solutions, and we look forward to working closely with the Tellabs team to enhance long-term value for its premier customer base. 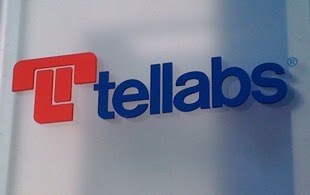 Tellabs reported 2012 revenue of $1.05 billion with earnings per share (GAAP) of $.47. The company has about 2,100 employees and is based in Naperville, Illinois. Earlier this year, Marlin acquired the Optical Networks business unit of Nokia Siemens Networks as well as Sycamore Networks. The companies were combined into Coriant, a new optical transport company headquartered in Munich, Germany. Microsemi agreed to acquire Symmetricom for approximately $230 million, or $7.18 per share, representing a premium of 49 percent based on the average closing price of Symmetricom's shares of common stock during the 90 trading days ended Oct. 18, 2013. Symmetricom specializes in highly precise timekeeping technologies for data, voice, mobile and video networks and services. It provides timekeeping in GPS satellites, national time references, and national power grids as well as in critical military and civilian networks. The company is based in San Jose, California. Microsemi said expects significant synergies from this immediately accretive transaction. Based on current assumptions, Microsemi expects the acquisition to be $0.22 to $0.25 accretive in its first full calendar year ending December 2014. Microsemi's current product lines include high-performance and radiation-hardened analog mixed-signal integrated circuits, FPGAs, SoCs and ASICs; power management products; timing and voice processing devices; RF solutions; discrete components; security technologies and scalable anti-tamper products; Power-over-Ethernet ICs and midspans; as well as custom design capabilities and services. The company is based in Aliso Viejo, California. "The acquisition of Symmetricom will create the largest and most complete timing portfolio in the industry today," stated James J. Peterson, Microsemi president and chief executive officer. "From source to synchronization to distribution, Microsemi will offer an end to end timing solution for an expanded range of markets, driving increased dollar content opportunity and revenue growth." "The acquisition of Symmetricom by Microsemi will create a powerful combination," said Elizabeth Fetter, Symmetricom's chief executive officer. "I believe Microsemi is the ideal company to leverage Symmetricom's technology and capabilities further into the communications market along with the scale to accelerate the adoption of the company's innovative new chip scale atomic clock (CSAC) technology into broader markets." 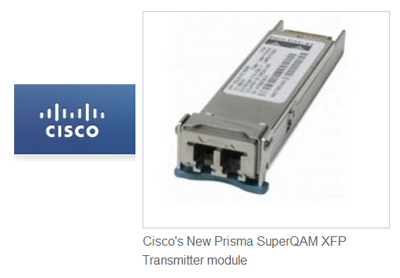 Cisco released a new high-density Prisma SuperQAM XFP Transmitter module for its flagship Prisma II optical video platform. The new XFP Transmitter module is another key piece of Cisco's Converged Cable Access Platform (CCAP) migration plan, enabling operators to double the density of their current chassis from 16 transmitters to 32 transmitters and reduce power consumption by half. Also, the module will fit into the optical physical interface card (PIC) in Cisco's next-generation Terabit CCAP product, the converged Broadband Router (cBR-8), which will directly link to the optical node and further reduce rack space in the cable headend. Cisco is currently conducting trials and plans for deployment of the new modules with several major global service provider customers. Equinix will renew existing leases with Digital Realty for five data center properties located in Chicago, Dallas, Los Angeles, Miami and Washington, D.C. The companies said all five of the leases were negotiated at market rates and include 15-year initial terms from the current lease expirations, as well as two approximately 10-year renewal options at pre-negotiated rental rates. Financial terms were not disclosed. 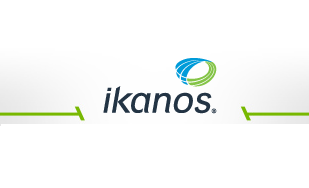 Ikanos Communications unveiled its next-generation DSL platform supporting the G.fast protocol for gigabit rates over standard copper lines. The new Ikanos Neos architecture leverages the company’s ultra-low-power analog technology for improved power-per-port performance, gigabit data-rates, and high transmission reliability and line stability in high-data-rate vectored environments. The architecture is designed to support all the CPE and CO requirements in the G.fast specification, including line-power, VDSL2 fallback, and G.vector, configurable as single or multi-port. Prototype availability is scheduled for the second quarter of 2014. "The introduction of our next-generation G.fast platform is a testament to Ikanos’ commitment to advancements in DSL technology and to our dedication to driving the industry forward while bringing innovative and differentiated products to our customers,” said Omid Tahernia, president and CEO at Ikanos. “To us G.fast is not simply the next step in the evolution of the DSL standard. 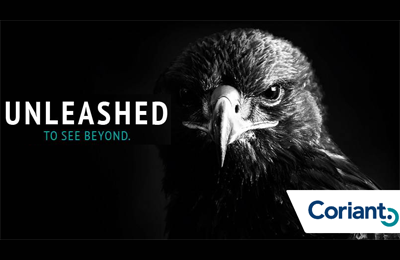 G.fast enables the realization of a vision where hybrid fiber-copper networks turn the promise of gigabit broadband into reality for telcos, effectively eliminating the need for costly FTTH deployments. While Ikanos has been at the forefront of driving the G.fast standardization efforts and is a strong advocate of standards compliancy and interoperability, we have maintained our focus on innovation and believe our G.fast family of products will bring unique and differentiated power profiles and robust transmission features to our customers, putting Ikanos in a leading position as the industry adopts the new standard." In addition, Ikanos introduced a new member of its VDSL2 CO (Central Office) processor family, the single-port Velocity-Uni. When used in tandem with a Fusiv Vx185-based home gateway, the end-to-end solution is capable of delivering up to 300Mbps aggregate data rate in FTTdp applications, covering a distance of up to 200 meters. Earlier this year Ikanos demonstrated an aggregate data rate of 150Mbps at a distance of 500 meters in a 192-port DSLAM configuration. The company has also demonstrated 300Mbps aggregate performance at 200 meters, ideal for short-loop FTTdp deployments. 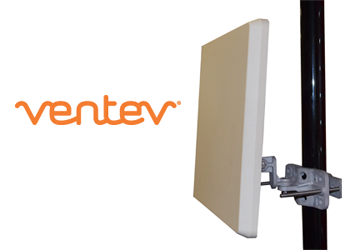 Ventev Wireless Infrastructure, a division of TESSCO Technologies, introduced a new line of TerraWave Solutions High-Density Antennas for Wi-Fi deployments in stadiums, convention centers, campuses, city centers, airports, manufacturing facilities, and other locales with high densities of wireless clients. Ventev says its next-generation antennas increase capacity and optimize coverage for Wi-Fi users in large, indoor/outdoor venues by providing a narrower, focused beam of coverage that reduces channel-to-channel interference. The highest-performing TerraWave High-Density 2.4/5 GHz Patch Antenna uses a narrow 35-degree beamwidth (compared with the traditional 50-80 degrees) and features a higher gain (14 dBi versus 6-10 dBi) that enables a greater distance between the antenna and users. Thus there is a much higher flexibility in placement without sacrificing network performance. The 2.4/5 GHz 10/11 dBi narrow-bandwidth TerraWave Ceiling-Mount High-Density Antenna for indoor applications features an inconspicuous in-ceiling tile mount that camouflages the Wi-Fi access point for improved aesthetics and increased security. It is the only ceiling-mount high-density antenna currently available specifically designed for indoor applications such as convention centers, auditoriums, large warehouses and factories. The new line of antennas supports all of the industry’s leading access points, including Aruba Networks, Cisco Systems, Juniper Networks, Meru Networks, and Motorola Solutions, among others. The antennas feature a broad range of technical specifications (gain, beamwidth, number of ports) and offer a variety of mounting options (ceiling, wall, mast/pole, under the seat) to ensure the right product is selected for the right application. Broadcom introduced its system-level vector processor (VP) for removing crosstalk interference on DSL networks . 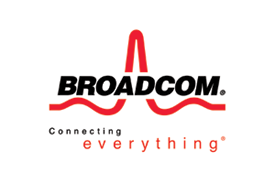 Broadcom said its BCM65500 solution enables services with throughput well over 100 Mbps downstream from any port of standard xDSL chassis of up to 384-lines. The BCM65500 vectoring processor is a turnkey system-level vectoring solution that offers Vector Control Entity (VCE) software to manage the BCM65500 and G.vector DSP chipsets, as well as Broadcom's high-performance, power-efficient 28nm XLP II control processor. The advanced microarchitecture leverages the 28nm process for industry-leading power and cost. Network operators can see performance benefits with the upgrade of a single system fabric board in an already-deployed DSLAM -- a comparatively lower investment to more than double the bandwidth of existing copper lines. "G.vector technology enables global operators to deliver high-bandwidth broadband services quickly, easily and cost-effectively by extending the performance of existing copper infrastructures," said Greg Fischer, Broadcom Vice President and General Manager, Broadband Carrier Access. "Our new system-level vector processor, utilizing Broadcom's field-proven G.vector technology and our unique DSL expertise, offers system OEMs a comprehensive solution to support the continued growth of DSL and FTTN services." The Broadcom BCM65500 currently is sampling. Broadcom announced its next generation, ultra high-performance digital subscriber line (DSL) and Gigabit routing chip for residential gateways and set-top boxes. Broadcom's new BCM63138 integrates single and multi-line ADSL2+/VDSL2 channel bonding interfaces supporting concurrent physical layer capabilities such as G.Vector, G.inp and SRA, along with GbE switching with advanced broadband WAN to home LAN traffic flow management. The design incorporates dual-PCIe interfaces to support dual-band concurrent 802.11n and 802.11ac (5G WiFi) wireless networking configurations, USB3 host ports and SATA interfaces for mass storage support, and a hardware secure boot mechanism. The BCM63138 is uniquely positioned to facilitate the combination of set-top box and DSL gateway functionality into a single platform. It also offers an integrated multi-channel VoIP with DECT baseband. 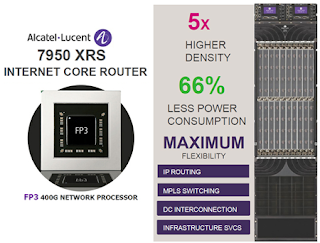 Telenet, Belgium’s leading cable broadband provider, has selected Alcatel-Lucent's 7950 Extensible Routing System (XRS) to meet the ever-expanding video and data demands of its customers. Alcatel-Lucent said its 7950 XRS will prepare Telenet for the next decade of demand-growth from both residential and enterprise customers, supporting the explosion of video traffic created by high definition content, on-demand viewing and multi-screen delivery the widespread use of smart-phones and tablets, and the rapid adoption of ‘cloud’ applications.